YOU SAY WENDIGO, I SAY WINDIGO: Most people use these two spellings interchangeably to describe the same being, but some believe the words have different meanings. Those who fall in the latter camp think "wendigo" describes a lonely man-beast who lives in the forest waiting to feast on human flesh, while the "windigo" is a cannibalistic spirit that possesses humans. Both concepts originate from Native American folklore and have ties to cannibalism. THE CREATURE: The wendigo is a cold climate creature that's been spotted in Canada and in northern states like Minnesota. Some locals who've encountered the beast consider it a relative of Bigfoot, but reports describe the beast as more of a werewolf than a Sasquatch. Ethno-historian Nathan Carlson says the wendigo is often described as a creature with owl-like eyes, large claws and an emaciated body. Others describe it looking like a skeleton with ash-toned skin. This strange being is said to live alone in the forest and feeds on human flesh. 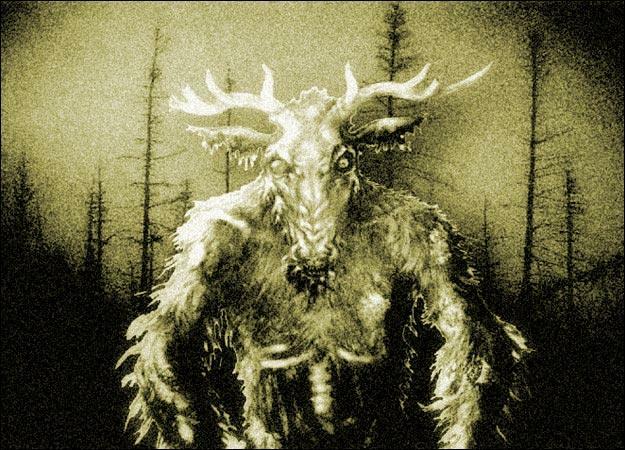 The Algonquian tribes called the wendigo the "spirit of lonely places," and they blamed many unsolved disappearances at the turn of the 20th century on wendigo attacks. THE SPIRIT: One of the most widely reported cases of a windigo spirit possessing a human is that of Swift Runner, a Native American who murdered and ate his entire family in the winter of 1879. He claimed to be possessed by a windigo at the time of the murders and was hanged for his crime. Although his case is one of the most well-known historically, there were many reports in the early 20th century of windigo spirits possessing people in dozens of communities from northern Quebec to the Rockies.